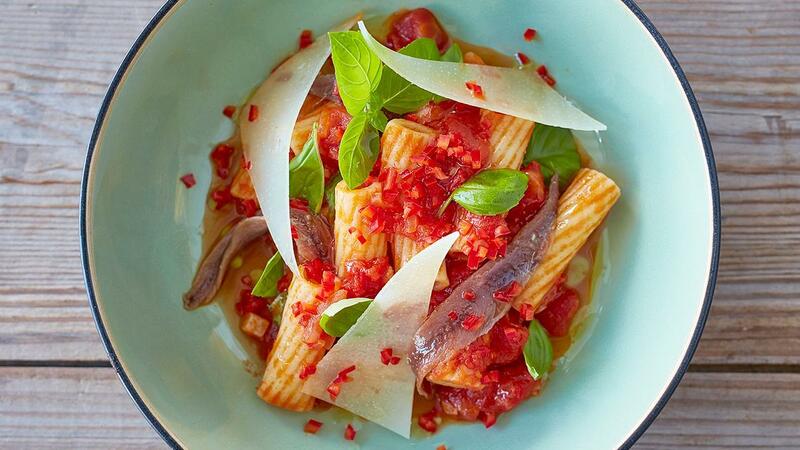 Anchovies, Pecorino cheese, and a healthy dose of red chillies come together in a smooth and spicy sauce. Served on penne done perfectly "al dente", your dinner guests are sure to savour every last drop. Boil the pasta al dente in water with salt until 3/4 cooked. Mix with some olive oil and let it cool down on a tray. Fry the onion and garlic in olive oil. Add the chopped chillies and stew for 3 minutes on a low fire. Add the Knorr Tomato Pronto. Add the boiled pasta and sauce to a pan. Reheat the pasta in the sauce. Let the sauce soak into the pasta. Decorate with anchovy fillets for a nice salty taste. Finish with thin slices of pecorino cheese and fresh basil. Add a few extra drops of olive oil on top.